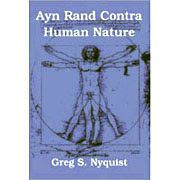 Rand's Atlas Shrugged is easily her most polarizing novel. It's hard to be neutral about it. You either love it or you deplore it. When I first read the work some thirty years ago, I wanted to like it, but it just would not go down. Whereas it only took me two or three days to read We the Living and The Fountainhead, Atlas required more than a month to finish, and even then, it was a tedious slog. I found the story preposterous, the characters flat and uninspiring, and the work's message shrill and one-sided. In Atlas, Rand seems to go out of her way to avoid subtle, nuance, and verisimilitude. She simply wants to preach, in parable form, her newly minted Objectivist philosophy. She does not shrink from hammering the same point over and over. Throughout the book there is the same hectoring tone, unrelenting and bristling with contempt, which she uses to try to beat the reader into submission. Even when I found myself largely in agreement with some point she kept making over and over, the shrillness of her tone and the insistent dogmatism of the presentation were off-putting and patronizing. Leonard Peikoff in his old age still finds it necessary to remind the world that he is the leading expert on Objectivism. Is another Objectischism brewing?